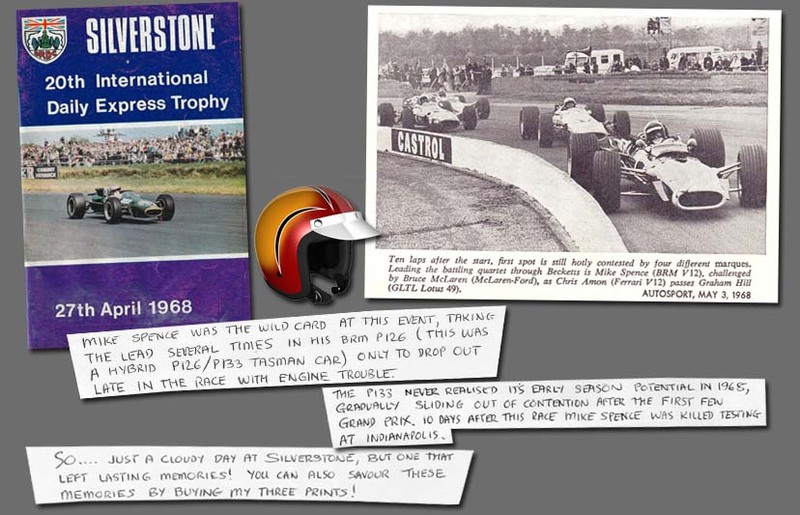 Starting from second on the grid, Mike Spence gave the McLarens quite a headache in the Daily Express Trophy F1 race at Silverstone on 27th April 1968 driving BRM P126/03. Mike Spence was the wild card at this event, taking the lead several times in his BRM P126 ( this was the hybrid P126/P133 Tasman car ) only to drop out late in the race with engine trouble. The P133 never realised its early season potential in 1968, gradually sliding from contention as the season wore on. Mike Spence was sadly killed at Indianapolis 10 days after the Silverstone race.